Ring in 2018 with a New Year’s Eve cruise from Miami aboard the Carnival Splendor. Carnival Spendor’s December 31st cruise from Miami departs at 4:00 p.m. You’ll spend New Year’s Eve at sea on your way to the ship’s first destination of the Princess Cays in the Bahamas, where you can spend the first day of 2018 soaking up the sun on white sandy beaches. The ship then sails on to Grand Turk, San Juan Puerto Rico, and Amber Cove in the Dominican Republic before returning to Miami. Prices start at $674 for inside cabins, $724 for Oceanview, $914 for Balcony cabins, and $1583 for suites. See pricing at CruiseDirect. This is one of the last chances to catch the Splendor in Miami. 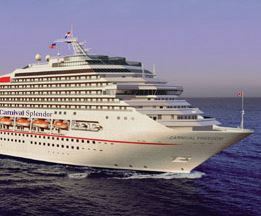 The ship’s repositioning cruise to Los Angeles departs on January 14th. When you choose to cruise from Miami, you’re departing from the world’s busiest cruise port. Over 4 million passengers leave from Miami for the Caribbean and other destinations every year. All of the biggest cruise lines have trips leaving from Miami, including Norwegian, Carnival, Celebrity, Royal Caribbean and Crystal, as well as companies with smaller fleets and smaller ships, such as Azamara and Oceania. Miami Cruise Guide provides you with the information you need about cruising from Miami, including info about ships sailing from Miami, cruise schedules, deals and special offers, and the best hotels to stay in before or after your cruise. © 2019 Miami Cruise Guide. All rights reserved.